It is getting dark. I have been writing all day it seems, catching up on the last of our trip north to Spokane and British Columbia. I am on a roll, you could say. I have been posting and there are now three posts waiting to go up. This is it. I probably won’t write another thing any time soon. This week we are off to the cottage, more repairs, more work on our winter place, visit daughter Deborah, hang out, do stuff. Nothing big, just a nice little 2 hour drive over the mountain to Grants Pass. With a few days over the mountain coming up with no computer, I have had a reason to stay focused on catching up the blog. I have at the same time had a chance to catch up on other’s blogs as well, make comments, laughing on facebroke with friends, talking on the phone with other friends, stepping outside for a short bit of lawn mowing or weeding, and then getting back to writing. The good part of this extended writing exercise is that the feelings of the trip have been coming back to me. I am writing what it felt like, not just the litany of what we did. For me, that is the fun part, remembering the feelings with my body and soul. Sometimes when I write later, that doesn’t happen, but as often as not, if I allow myself to really get ‘into’ it, it does. I am still in the feeling of the previous night at the Canyon Creek Campground west of Kettle Falls. The last time I was on this road was on what was called “The Densic Tour”, a soil thing where we looked at dense glacial soils in several areas in the northern part of Washington State. It was a great trip with wonderful scientists talking about really cool dirt. The drive brought back good memories of the best parts of my working life. When Mo and I woke up on Friday morning, the rains had stopped but the skies were still cloudy. Back on the road, we climbed over Sherman Pass, stopped at the summit to read the signs, and learn about this highest drivable mountain pass in the state of Washington. Didn’t really seem that high to me, compared to some of those in Colorado and Montana, but still, the signs were nice. Especially the coyote sculptures and the information about the local tribes. The town of Republic is in a wild part of Washington, remote, gold country, and still is a small town without many amenities. There is a fossil museum, a couple of nice hotels, good coffee, that sort of thing, but not a lot to make us stop. We had originally planned to travel south directly toward Keller and turn toward the Grand Coulee dam from there, but a few miles south on Highway 21 we saw a sign stating that the road was closed 17 miles ahead. The road was narrow, there was nowhere to turn around so we kept driving a bit before Mo tried to make the turn and failed. It was a few tense moments as we were slightly jackknifed in the middle of the road before she managed to get us going south again. Finally found a place to turn around, The road was closed due to the large fire burning on the Colville reservation. I knew about the fire, and later when I looked at Inciweb for fire information, realized it straddled both sides of our chosen route for several miles. I hadn’t realized it was still burning. We returned to Republic, with an extra hundred miles or so add to our day and knew it would be late when we pulled into the reserved campsite at the familiar LePage COE park on the mouth of the John Day River. A 476 mile day is a bit much, but it was so much better than again following the interminably repetitive trip through Spokane and the Tri-Cities. The road from Republic to Tonasket was a bit winding, but not a problem at all, and once we reached Tonasket and the river we again had to decide whether to stay on the main route south to Wenatchee or continue with our plan to cross the reservation directly southeast toward Grand Coulee. The Grand Coulee Dam is another place I had visited but Mo had never been there. What can I say about that dam. Sadly, it displaced many people and a few towns. It destroyed the salmon run on the northern part of the Columbia River, the salmon no longer migrate to Kettle Falls. And yet it is one of the greatest accomplishments that man has built. I love the story of this dam, much as I dislike the story of Glen Canyon. Who knows why I pick and chose my battles, but Grand Coulee Dam isn’t one of them. FDR was president and we were in the midst of a deep depression when the dam was built and thousands of people came from all over the country to build it. The visitor center is wonderful, with a 45 minute movie about how the dam was built. Fascinating! At the time, it was the largest concrete structure in the world, and it remained so for a long time. It was the first of the dams to attempt to control the Mighty Columbia River and was initially built for the purpose of irrigating the desert of the great Columbia Basin. Only later did power generation become the major output of the dam and now it creates renewable power for hundreds of thousands of people. The big generators are a wonder of engineering, but even more so are the pumps that lift water several hundred feet from Lake Roosevelt to Banks Lake to be the source of water for hundreds of thousands of acres of rich farmland. The exhibits at the center were fascinating, including the wheelchair that FDR used when he visited the dam. It was worth every mile and every minute that we spent to take time to visit and learn again about this incredible project. I know there is good and bad about the whole dam thing, and yet seeing it was amazing. I loved it and so did Mo. We left the dam and traveled south toward Ephrata, along Banks Lake and past Steamboat Rock State Park. Turning South from Ephrata we followed the highway toward the Dry Falls of the Grand Coulee, one of the more magnificent geological sites in the entire west. As a new soil scientist in the Inland Northwest, my career was defined most by two huge geologic events, the eruption of Crater Lake/Mt Mazama, and the Great Missoula Floods from 13,000 years ago. Knowing the ongoing story of the Great Floods, studying the landscapes created by these Ice Age floods, has been one of the most fascinating parts of mapping soils in Washington. It almost made me cry to see the monument to J Harlan Bretz, the geologist who came up with the crazy theory of a catastrophic flood and was ridiculed for years before his theories were finally believed. Evidence of the floods are everywhere in the Inland Northwest, but nowhere greater than Dry Falls. The visitor center sits high on a ledge, just a few hundred feet from the stone monument viewpoint built in the 1920’s The scenery is breathtaking, the paintings of the size of the falls, bigger than anything that exists on earth today are fascinating. In all my years of working around this part of the world, I had never had the chance to actually stop at Dry Falls and enjoy the exhibits and look over the edge of that great piece of basalt. The great Columbia Plateau is the second largest extensive basalt plateau in the world, only one is India is larger. I love this landscape. Back in the rig, we continued south toward the fading light as we approached the great and mighty Columbia River in the canyon below. Huge windmills signaled that we were close to LePage once again. Renewable power. Birds and fish are the losers, but who wins when coal isn’t pumped into the atmosphere. It is a conundrum, but I still love the windmills, and I love Grand Coulee dam. Go figure. When we arrived at our trusty campground, reservation in hand, the kiosk was closed and the sign said Campground Full. Sure enough, a reserved tag held our spot and we set up in the twilight, once again turning on the air conditioner for the warm temperatures. This time, however, I was able to turn it off and switch to the fan before 10 PM and that was encouraging. On the next day we would be traveling Highway 97 home, through Biggs Junction, Moro, Madras, Redmond, Bend, LaPine and Chiloquin before turning west to cross the green Wood River Valley and slide into home in the forest. Even two weeks sometimes feels like forever when I am away and it is always good to get back. Next: not a thing that I can predict at the moment. There are many options when planning the route home, but there was no option that didn’t include visiting the little town of Nelson on the west arm of Kootenay Lake. I remember Nelson as a small logging community, but even back in the 70’s and 80’s there was some cute stuff there. By the time my friend Maryruth and I saw it, the cultural creative boom was already happening. Our last day in British Columbia started with rain, and it only got heavier as we traveled south. Big thunderheads loomed above us as we packed up the rig and the first big drops fell just as we drove out of the campground. There is a dump station associated with the campground in Kaslo. It costs $5 Canadian if you are a registered camper, $8. if not, but it is only open for a couple of hours in the morning and in the evening. We wanted to leave early morning, but the 9am opening of the dump lock gave us the luxury of a leisurely breakfast. We decided to go get in line about 8:45, just in time to be ahead of a big fifth wheel that thought they were going to dump immediately. Sorry, I told them, the manager doesn’t get up till nine. She has a big sign on her door that is a pretty good indication that she doesn’t want to be bothered until exactly 9AM. Who can blame her. Being a campground host must be awful sometimes, everyone always wants something. Sure enough, just at 9, she showed up looking a bit sleep rumpled and unlocked the cover. We were ready with hoses out and ready to go so it only took us a few minutes to dump. We have that teamwork down pat. We also have the hookup the car thing down pat as well, and I laughed to see a couple of people in the campground taking time out from morning coffee to watch us hook up the Tracker in a few quick clicks. Moments like that I get all cocky and like to show off. Men especially get a kick out of watching us do things efficiently. I have to be careful to not get too cocky because I could just as easily do something stupid or the hitch would stick or the pins would drop in a manhole or something. Still, we were on the road by 9:10 after a particularly good dump. You know the ones. The tank sensors are all the way green, the flashlight down the toilet reflects on the shiny bottom, and all is good. I can’t figure out why they all aren’t like that. The road to Nelson followed our route to Balfour and continued along the West Arm of Kootenay Lake, where we saw gorgeous sandy beaches along the beautiful wide river/lake and homes to match. The closer we got to Nelson, the more waterside mansions began to appear. Hmmm, I could live here, I thought. It was breathtakingly beautiful. A bit later, as I perused the Real Estate magazines in Nelson, I saw that those houses were in the vicinity of a couple million bucks. Gentrification is everywhere. What happened to the sleepy logging town in the wilds of BC?? We did love Nelson, and did our usual initial search for the Visitor Center. Right in front of the building, across the street, was curb parking for the MoHo and Tracker. No parking meters, and a driveway behind us so that if someone parked in front of us we could still exit gracefully. A quick stop inside yielded a pretty young thing who knew ALL the best places to eat a great breakfast and told me we could park for a few hours free if we wanted to. With the cool rain falling, Abby was quite content to remain inside resting. This is a new phenomena. At 12, it seems her separation anxiety has subsided enough that sometimes, not always, she will wait in the MoHo without barking and going into a general state of panic. Lucky for us. Hard rain means that even with dog friendly patios for dining, we might not want to sit outside in the rain with the dog. Climbing the stairs in the lovely little town built on the side of a cliff, we found the main drag and the string of shops and restaurants that are the mainstay of Nelson. Full Circle Cafe at 11AM still had a long line of folks waiting, but it was the best and we wanted to try it so we put our name on the list and waited. What a great place. More of that signature British Columbia organic stuff with tofu scrambles, and 6 kinds of free range eggs benedict selections. I think they specialized in hollandaise because it came on everything, even the tofu! Yum. I had an omelet with perfect caramelized onions, goat cheese, and French ham, topped with hollandaise. Insanely good. Mo had what was called the Redneck Burger, free range beef, but that is where the redneck adjective stopped working. I never saw spinach and sprouts on a redneck anything! Her salad was one of the best I have tried. Yum again. We wanted to get back on the road, with no idea of where we might spend the night, but knew it would be somewhere back in the US. I navigated toward the border, but my BC map in the big Atlas didn’t have enough detail, and with my phone turned off I also didn’t have Google to help out. The GPS is worthless if you don’t have an address, and we didn’t really know exactly where we were headed anyway. Somehow we ended up going through Salmo instead of Trail and to the beautifully quiet border crossing at Metaline Falls. We didn’t stop at Salmo, but in passing I caught glimpses of some rather amazing stone murals that are the pride of this small town. Hard rain and the upcoming border nixed any ideas of exploring. Getting back into the US was a bit more complicated than we have ever experienced, and the main culprit was dog food! We knew about the requirements, so Mo was prepared with food in the original bags, but they saw the doggie treat bag and had to check that as well to be sure the treats were made in the USA. They also asked to come in the rig and would we please restrain the dog. Then they asked for the keys to the baby car where the big sack of dog food was stored. After searching the car and part of the rig, they then wanted an additional photo that matched our passports. While looking at our passports and drivers’ license, they asked what we did before we retired, where we were going, where we had been, and the names of our firstborn children. Oh not that last part actually. They were kind and we had nothing to hide so it was more entertaining than anything, but different than we are used to. After 20 minutes or so we rolled back into the good ole USA. Metaline Falls is a tiny town on the gorgeous Pend Oreille River, the downriver part of the same river we traveled on our trip north previously. I had never been on this route and it was gorgeous. Even in the rain we stopped to hike up to the lovely falls at the Sweet Creek Falls Wayside on the route of the North Pend Oreille Scenic Byway. For those not familiar with the northwest, the pronunciation is Pond er Ray. Just thought I would mention that. As Spokane is Spo Can, not Spo Kane…and Oregon is Or E Gun not Or E Gone…and Nevada…ooops. guess I got carried away. I have been writing these posts for a couple of days now and am getting a bit rummy. We turned west toward Kettle Falls through the town of Colville. It was originally the plan to enter the states through Northport and possibly find a place to camp somewhere along the Columbia River. Instead, far south of good camping spots on the river, we continued west on Highway 20 toward Sherman Pass. Stopping in Kettle Falls to top off our fuel, (did I mention we didn’t have to add fuel to the MoHo in Canada?) we wanted to be sure we were ready for boondocking and using the generator. Sometimes it is easy to think, oh we have more than a quarter tank, we can fuel up tomorrow. Not so smart when you want to run the generator. It doesn’t take much fuel, but it doesn’t like a tank below a quarter full and will not run when it drops below that point. We started up Sherman Pass with a couple of campgrounds in mind, but looking more closely I could see that the more distant one was at 5200 feet and only allowed rigs less than 24 feet long. We could fudge that sometimes, at 26 feet, but why bother when the closer campground had a 30 foot length limit. Turned out to be a fabulous choice. Except for one other rig on the opposite side of the campground, we were the only ones there. We got a perfectly level site with a campfire ring and no campfire restrictions, and best of all a nice big stash of ready cut firewood for Mo to split. Mo loves a good campfire and with fire restrictions being all over the place it was nice to enjoy a big fire and some marshmallows. The campsite fee was a hefty $3.00 with our senior pass. There were bear warnings at the campground kiosk, so we kept Abby close, but most of the huckleberries were gone so I didn’t worry too much. Would have been nice to see a bear from the safety of the rig. The signs indicated that in addition to black bear, there were also grizzly in the area. What I didn’t know at the time is that there are also some viable, active wolf packs in that part of the country as well. After our yellow lighted nights at the Kaslo Campground, the thick darkness and quiet of the Canyon Creek FS campground on Sherman Pass was incredible. The sounds of the rain and a huge thunderstorm only added to the coziness of the MoHo, and actually being cool enough for a blanket was pretty nice, too. I thought I could fit the entire trip home into one post, but it seems that isn’t to be the case. We did some cool new stuff on the rest of the route that I don’t want to skimp on. Guess I’ll have to go change the title for this one. I spent a lot of time reviewing the few options for RV parks in the vicinity of Kaslo before we made our reservation. I know that reviews are not always accurate, but if there are bad reviews, I try to check for the date and then see if the good reviews are a response to the bad ones. Sometimes it is fairly clear that the park owners or managers have tried to offset the negativity. In this case, I decided to ignore the few bad remarks about the Municipal Park and pay attention the bad remarks about some of the other places. Turns out I made a good choice. I wanted hookups, and what I didn’t learn from the reviews is that anything more than 15 amp power is rarely available. The Kaslo Municipal Campground had just three sites with 30 amp power, so I was extremely glad that I had made a reservation. When we arrived, there were a couple of other rigs in line, and as I walked up to the crowd of people, the manager said, “Excuse me, but I need to attend to Sue here before I check you in because she has a reservation”. She knew who I was from our rig! Pretty nice. Then she gave me a choice. We could take the nice shady site on the hill, not very level, and with 15 amp power, or we could take the crowded sunny (hot) site with a sliver of lake view next to the park and 15 amp power until the next day when we would get the 30 amp post. I was all for the shade, but Mo opted for the 30 amp. Either way, our first night was going to be a hot one. Once again, we put the fridge on gas only and didn’t even bother trying to turn on the air. The fan had to be enough and with the temps a hot and somewhat humid (for the west) 90 degrees F we waited for a breeze. Nice thing about our site, however is that it backed up to the park, with just a few hundred yards to a spot where we could launch the kayaks. With fairly strong winds on the lake, we didn’t unload them the first night, deciding to wait for better weather the next morning. Instead we had supper before taking a lovely stroll along the lake and up toward the sweet little town of Kaslo. It still had the charm that I remembered, but just a bit more so, with many eateries, little shops, and the beautiful Kaslo Hotel right above the shoreline and the marina. Even with the smoky skies, the surrounding mountains were magnificent. My favorite moment, however, was spying these two ladies in their rigs visiting along the park in front of their lovely retirement home. If it weren’t for winter, this might be a really nice place to spend your last days. The next day we launched the kayaks, in spite of the strong breezes and managed a few miles south of town along the shore, and then back north and into Kaslo Bay. The water was deep and clear, but the beaches near the campground are made up of large rocks, making for some gingerly walking to get the boats in and out of the water. On another day we decided to explore the road north toward Duncan Lake, and took the long dirt road to the towns of Argenta and Johnsons Landing. We read about these two historic places in the Kaslo travel guide and Mo loves old small historic towns, so 30 miles or so round trip on a dirt road seemed worth it. To our surprise, Johnson’s Landing is completely locked up and private, and we didn’t drive as far as the world famous trailhead at the entrance to Fry Canyon. There are a LOT of day hikes and longer hikes in the Kaslo area. Someday, when Abby doesn’t need to be pampered with short walks, we may come back and hike the canyon, but on this day we knew long hikes were not on the agenda. Abby is doing well, but long hikes are out of the question. On a bit more sober note, I took several photos of what looked to me like a glacial outburst type of landform, adjacent to the lake near Johnson’s Landing. Nowhere did I find information about this until today, researching links for this blog, when I found the story of the devastating Johnson’s Landing Landslide of 2012. (link here) It is somewhat disturbing to me that I could blithely drive around this area, that I could talk to people in Kaslo about being there and going there, and not one local person mentioned this tragedy. Just for perspective, here is another ( link ) to what we read about Argenta and Johnson’s Landing from the BC tourism website. Sounds great, doesn’t it? We did finally find something to look at in the community of Argenta, where the travel guide said “there are many self sufficient types located here.” I imagined hunters and fishermen, but instead we found huge organic gardens and lovely tanned men in colorful sarongs and young women with beautiful hair driving older SUV’s. Not many mind you, but enough to realize that this area was an enclave to hippies in the best sense of what that word can mean. Today, while researching this post, I found this rather fascinating story about Argenta that wasn’t in the Kaslo Visitor Guide. Seems as though a group of California Quakers established the community, building the Argenta Friends School where they taught homesteading skills and welcomed draft dodgers. The school was closed but the nature of the community has remained intact. Peace loving, simple living Quakers and peace loving, simple living hippies have a lot in common. We drove north toward the Duncan Dam, found the beautiful overlook and gorgeous lake, and then traveled north even further to the tiny hamlet of Howser. There is a lovely Provincial campground at the end of the road, and we were really sorry we hadn’t put the kayaks back on the car after our day on the water at the bigger and windier Kootenay Lake. I took photos of campsites where the MoHo could fit, with only a couple of miles of dirt road to navigate. I am sure we will return to this place. Both of us loved Duncan Lake more than Kootenay Lake: it was far more remote and protected with the glassy water kind of kayaking and bird life that we love. We also checked out the two Provincial campgrounds right on Kootenay Lake just a few miles north of Kaslo. Both Davis Creek and Lost Ledge campgrounds are on the water with beautiful views. No hookups and no reservations, but there were spaces available on the day we visited, so we do hope to someday return and camp. 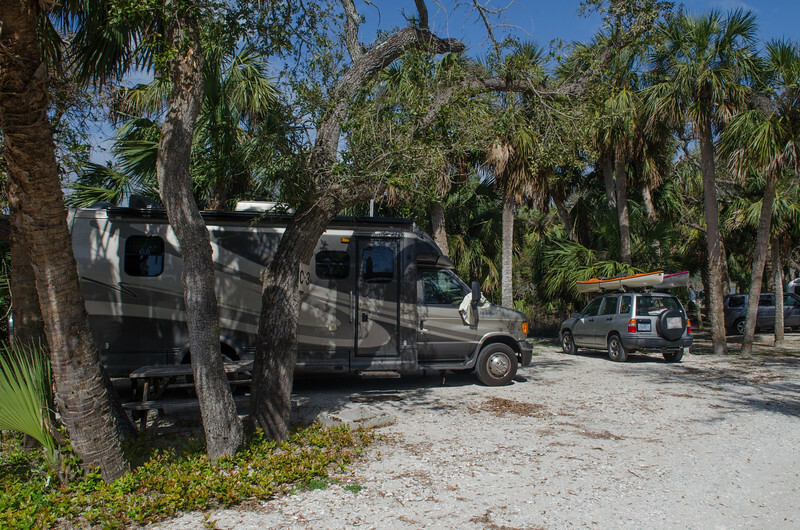 We decided a few days of boondocking would be interspersed with a day or two at the Municipal Campground where we could charge up and dump before going back to the north. A nice advantage of returning to Kaslo was the delightful outdoor eatery, boasting gluten free sourdough bread, and non GMO foods. Healthy alternative lifestyles are the norm in this part of British Columbia and it was so refreshing. Of course, I had a Rueben hot dog, not very healthy or gluten free, but oh so yummy! They had home made ice cream there as well, but we never managed a return visit. Our last day turned out to be cooler and rainy, and we just took some time to relax, go for town walks, and in the afternoon Mo drove me 12 miles or so back south along Highway 31 to Ainsworth Hot Springs, high on my list of todo’s in this area. Mo didn’t want to leave Abby for an extended time, so while I went to the springs, she explored the lakeshore toward Balfour and found a gorgeous beach with beautiful water and sand where Abby played and swam. Mo said she even swam all on her own just for fun without Mo having to throw something to encourage her. I spent two glorious hours, for the paltry sum of $11.00 Canadian, soaking in the hot odor free mineral waters that have made Ainsworth famous. The springs are no longer in their natural state, but the water is wonderful, and in the big pool the exchange rate is about 6 times per day. I was glad it wasn’t a weekend, but the place was quite crowded with kids and people, mostly Canadians, but I heard many different languages being spoken. French, of course, but also Russian and I heard a woman with a beautiful accent from South Africa. It was fun being there alone, and I didn’t engage much, but listened to the Canadians talking about their country and their towns. Especially interesting were the conversations about Calgary becoming way too big with crime coming into the neighborhoods and Lethbridge being a gorgeous place to live with a wonderful university. I do love my country, I wouldn’t choose any other, but I did find myself unwilling to give away my US accent. I felt like a true foreigner in a foreign land. Don’t let the similarities fool you, Canada is NOT the USA. The best part about Ainsworth Hot Springs are the caves. They are shaped like a big horseshoe, and the water is about waist deep and the temps were 104F on the day I visited. You enter the cave, and then walk through into the dark hot steamy interior. Part way in a very hot waterfall provides a great neck massage if you can stand it and by the time you reach the other end of the horseshoe you are ready for some cool air! The cave ends in another hot pool, and adjacent to that is the ice plunge pool. On this hot day, the ice plunge was a balmy 49 degrees F, but after the heat and steam it was still enough of a shock to get your blood tingling. The ice pool also has a waterfall that is a bit harder to stand under than the hot one. After a few rounds through the cave and the ice plunge, I would go back to the main pool and eavesdrop on all sorts of nearby conversations. When Mo returned two hours later to pick me up I was limp as a dishrag. Once again, don’t pay attention to the negative reviews. Ainsworth is a treasure to enjoy for exactly what it is. Not fancy, not natural, but a special place. There is so much to see in the area, great art galleries and some small museums in Kaslo, including the beautiful sternwheeler the Moyie, but on this trip even three full days and half another didn’t give us enough time to enjoy all of it. The S.S. Moyie is the world’s oldest intact passenger sternwheeler and has been lovingly restored in the last few years. It represents a great era of the history of Kootenay Lake and Kaslo. I loved hearing the loud steam horn blow in the afternoons. It was with a bit of melancholy that we left on Thursday morning. But there was something very special waiting for me back in Klamath Falls on the coming weekend and I wasn’t about to miss it. We knew our time wouldn’t be long enough but it was OK. We saw enough to know that this is a place we will return without question. It is under 1,000 miles from home and best of all, it isn’t at all crowded! After being in the Canadian National Parks of Banff and Jasper when it felt like a crazy zoo, it was so refreshing to enjoy the beautiful Canadian Rockies in such peace.